Does sonofbragi belong in this group? Does elvis210 belong in this group? My ambition is to become Artist. I want to face all the things that can fulfill my dreams right here . . 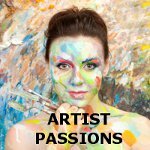 Interested Artist I've been on a ton of sites looking for people to explore my passions with, but most aren't for artists. I'm very dedicated to my craft and spend a lot of time working. I'm new to the Philadelphia area and never get to meet new people, so I'd really like to make new friends! Does kingofhearts19 belong in this group?